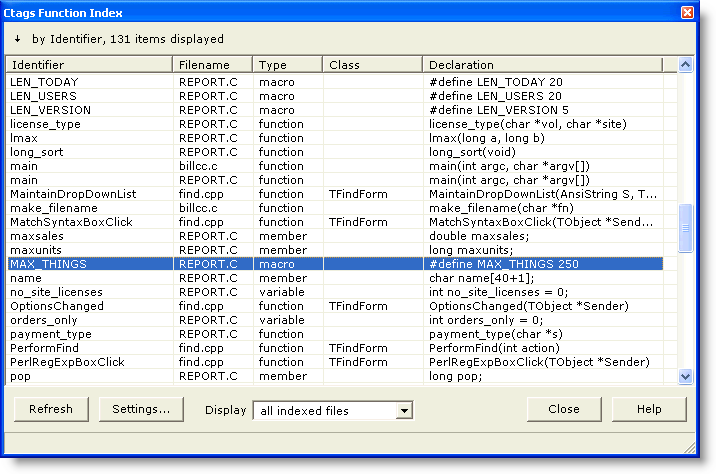 The Ctags Function Index command displays a dialog containing a list of functions, procedures and global variables for the files currently being edited. The list can be used as a handy reference to function names and their calling parameters, or as a navigation aid: double-clicking on an entry will jump to the file and line that corresponds to the highlighted entry. The dialog is non-modal, so it can remain open alongside Boxer as you're doing other work. In order to index the edited files, Boxer runs an external program and then reads the output file it creates. Exuberant Ctags is a fast, multi-language implementation of the original ctags and etags programs that are available on Unix. Exuberant Ctags is distributed under the GNU General Public License. The program ctags.exe and a zip file containing the program's source code have been installed in a directory named 'Ctags' beneath the Boxer installation directory. The list can be sorted on any of its columns by clicking on the associated column title in the header at the top of the listing. Clicking on the same header a second time will reverse the order of the sort. The display of these popup tool tips can be configured by clicking the Settings button, which leads to the Configure Ctags Function Index dialog. Use the Refresh button to re-index all open files, and any other 'extra files' that may have been designated in the Configure Ctags Function Index dialog. You might want to use the Refresh button when changes have been made to an edited file that would invalidate the information that was previously gathered. For example, if a function's calling parameters are changed, or a function is added or deleted, use Refresh. It is not necessary to use Refresh simply because the line number of a function's declaration has changed. The indexing is maintained in a format that is not sensitive to changes in line numbers. The Settings button will display the Configure Ctags Function Index dialog, which provides options that control how and when files will be indexed, the appearance of the function list, and whether popup tool tips will be displayed. Extra files to be indexed can be designated in the Configure Ctags Function Index dialog. The Display setting will also influence which identifiers are visible to the popup tool tip feature. If you have filtered the listing to show only those entries in the current file, for example, you may wish to restore the Display setting to all indexed files so that the full collection of indexed identifiers are available to the popup tool tips feature.